#7) Food aversions/cravings – while I’m no longer sending Gaby out at Midnight to find me some Ben & Jerry’s, I have been having food issues. Chemo has altered my taste buds so for me to taste anything, I need to use spices and sauces. The other day, I used some BBQ sauce on my eggs since I couldn’t taste anything. #10) Back pain – It’s not as bad as when I was carrying an extra 50 pounds of baby weight, but spinal taps are rough on the lower back. But then I look in the mirror and see my swollen face and my bald head, and I’m brought back down to earth. I know that the big difference is that I’m not bringing a life into this world, I’m trying to save my own. Today, I’m sitting in my living room waiting for the call from Shaare Tzedek. The call to come in for a treatment regiment that will require me to stay for 4-6 days of high-dose methotextrate. 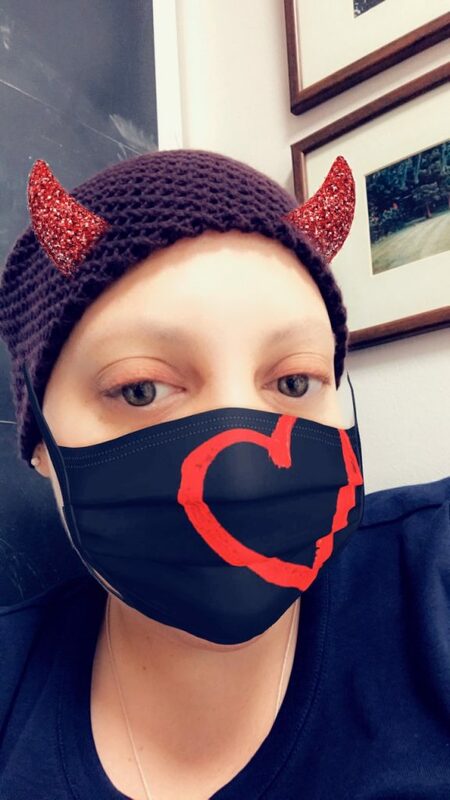 The reason for the long stay is because this chemo has a high level of toxicity and so I spend about 24 hours getting the drug and then 3-4 days on IV fluids to flush it out of my system. The drug can cause severe damage to my kidneys and digestive system, which is why it is always given at the hospital. I need to do two rounds of this regiment which means another week in the hospital is in my near future. So, I’ve got my Laura Ashley bag packed and I’m waiting for the call from the nurses on the 7th floor. The call can come at any minute and it could come today or tomorrow. I’ve taken off the entire week from work, talked to my kids about it at length so they can be emotionally prepared, and am just sitting here waiting for them to tell me it’s time. The last time I waited for a call like this, I was 42 weeks pregnant with my eldest and she wasn’t interested in coming out. The amniotic fluid in my womb was starting to lower and my body was deemed no longer a viable host for the baby, which means it was time to be induced. It was a Thursday morning in early December and we were told to go to Hadassah Ein Kerem for me to be induced. In preparation, I took a long shower, blow dried and ironed my hair straight and put on my comfiest pair of Gap sweatpants, long-sleeve black t-shirt and a shmata. I remember thinking that I wanted to iron my hair because I wanted the baby to think her Mommy was pretty. I packed the same Laura Ashley bag, but instead of PICC line covers and hats to cover up my bald head, I put in boxes of chocolates for the nurses and anaesthesiologist and an outfit for the new baby. When we go to the maternity ward, they put the infusion into my arm (doctors, tell me what this is called in English please! I keep calling it a hemlock and it’s not the right terminology) and told me to wait. And we waited and waited and waited until finally, they told me that they didn’t have room on the maternity ward and they sent me to a bed in the unit for high-risk pregnancies. We later learned that the woman in the bed next to me was possibly having a miscarriage and she spent hours just crying. The clock kept ticking and it was getting later and later at night, and Gaby needed to get some sleep. Finally, we called Dr. Yanai and asked her if we could just go home for the night and when the maternity ward had room for me, we would come back in. It was a process but Dr. Yanai cleared me to go home, and a nurse came to remove the infusion. We stole away from the hospital at Midnight, like thieves in the night! I remember giggling as the three of us jogged towards my mother-in-law’s car. We felt badass leaving the hospital, even though I was a little nervous that something bad could happen to the baby. We got home, put our cell phones in to charge with the ringer on high, and fell asleep. I got the call at 5:30 a.m. Friday morning that the maternity wards was ready for me. I was exhausted but quickly pulled myself out of bed and hopped into the shower. I washed my hair and didn’t bother to blow it dry, there was no time. I put the wet strands into a messy bun while Gaby got himself davened and ready and my mother-in-law picked us up by 6:00 a.m. I skipped breakfast, which was a big mistake, and this time the maternity ward was ready and set up for me. Thirty-six hours of hard labor later, at 6 centimeters dilated, I was just done. Exhausted, starving and an emotional wreck from a traumatic labor, I wanted her out of me. Dr. Yanai urged me to try pushing and I said no way, I wanted a hamburger. I wanted a hamburger with french fries and plenty of ketchup. I was starving and I was done. They had moved me into a laboring room and I heard Havdalah sung in the corridor. The hours were ticking down and I wanted her born before Sunday. Then her heart rate took a big dip and suddenly, everything went really quickly. I was wheeled into the operating room and she was born by C-section at 11:15 p.m. Saturday night. She was so so beautiful; they wrapped her up and let me give her a kiss before whisking her away while Dr. Yanai put my insides back together again. It was one of the happiest moments of my life, I was finally a Mommy. So, I wait for the call today and think back to that moment nine and a half years ago. I hold on to the happiness of that moment in my life. I think back through the pain and difficulty of the labor to the end result, a precious, beautiful, amazing little girl. And I steel myself for the pain and difficulty that awaits me this week, and focus on the beautiful family that waits for me back home. Shira-you are such an inspiration!! My prayers are with you as you kick this thing!! Love ya!